Worldwide, more than 7 million deaths occur each year due to high blood pressure. New research indicates that lack of adequate sleep could be contributing to this widespread health problem. 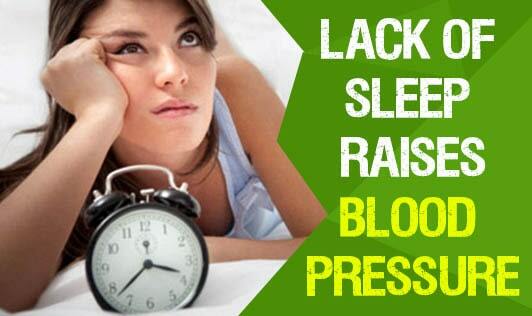 A recent 5-year study found that for each lost hour of sleep, the risk of developing high blood pressure increased by 37%. Most people who slept at least 7 hours had the best health. In another study, people who slept 5 hours daily were 60% more likely to develop high blood pressure compared to people who slept 7-8 hours a night. If you want to keep your blood pressure in the healthy range (less than 120/80), aim for at least 7-8 hours of sleep daily. Taking a midday nap can also be helpful in reaching your 7-8 hours. 1. Set a sleep schedule and stick to it. 2. Exercise daily. Since late evening exercise can keep you awake, exercise in the morning or early afternoon. 3. Avoid caffeinated drinks and foods that contain caffeine, such as chocolate. 4. Avoid alcohol, which can disrupt sleep patterns and delay the onset of sleep. 5. Maintain a healthy weight. Being overweight increases the risk of snoring, sleep apnea, and other sleep disorders. 6. Have a light dinner. Eating too much before you go to bed can lead to heartburn and poor digestion and disrupt sleep. 7. Reserve the last few hours of your day for calm activities. Avoid playing competitive games (even chess or cards), watching exciting programs on television, and reading suspenseful books. 8. Assess your life. Are you stressed? Could you be depressed? If so, consider consulting with a health professional. If you can't get to sleep within 20 minutes, get up. Stay in dark or dimly lit rooms and do something repetitive or boring until you feel sleepy. Some people consider middle-of-the-night insomnia a perfect opportunity for reading the owner's manual for any household electrical appliance. National Institutes of Health. 2009.